I use the Contain Pod drill to teach our defensive ends not to crash. This football drills simulates game situations. 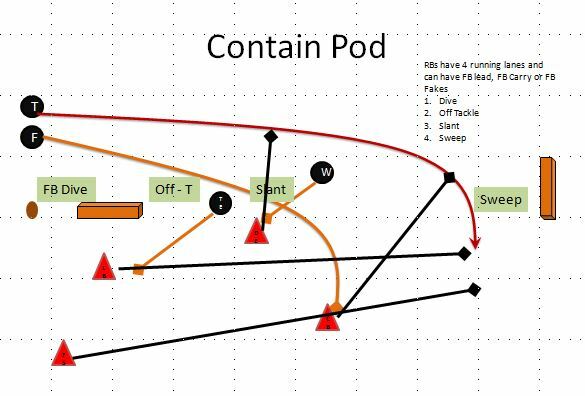 The Contain Pod Defensive Youth Football Drill is a great pee wee football drill to train your defensive ends and outside linebackers how to play contain responsibilities. I also incorporate the inside linebackers and other defensive backs in this drill to simulate more game type situations. If your little league defensive ends or outside linebackers need some help learning their contain responsibilities the Contain Pod youth football drill will introduce them to outside running defensive concepts, keys and reads. Youth Football Drills. Play for Fun and Winning is Funner! Here is an updated video from my YouTube Channel. If you enjoyed the video please like, comment, share and subscribe. Coach, love the drills – thanks for sharing. When you run the Contain Pod drill, are you having the FB and TE block the defense to simulate the actual play? For example, on the sweep, have the TE block the DE. Also, what program are you using to diagram your drill?